Brrrr ... It is cold out across the great Midwest. It is winter after all and inclement weather is to be expected! Today my family will be packing up and driving several hours to meet the two newest members of our family: Twins! a beautiful niece and nephew. But with that comes a 5+ hour drive, leaving lots of room for a bumpy ride. What do you pack in your car in case of emergency during inclement weather and possible time stuck in the car on the side of the road? 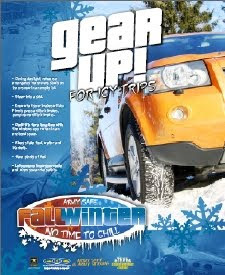 Here are some great driving tips from the Army Combat Readiness/Safety Center: The “cold” facts on winter driving. So now it's your turn! Let us know what you put on your 'to pack' list during the winter months. Don't forget the Garmin... or whichever nav system. And your cell phone, with recharger cord. We had a doctor's appointment at a Medical Center today and were very surprised by some nasty weather that rolled in and caught many drivers unprepared! As we traveled the interstate the road became treacherous! Multiple car accidents, spin outs into the median, etc. Finally, it came to a complete stop. You never know when that kit is going to come in handy!